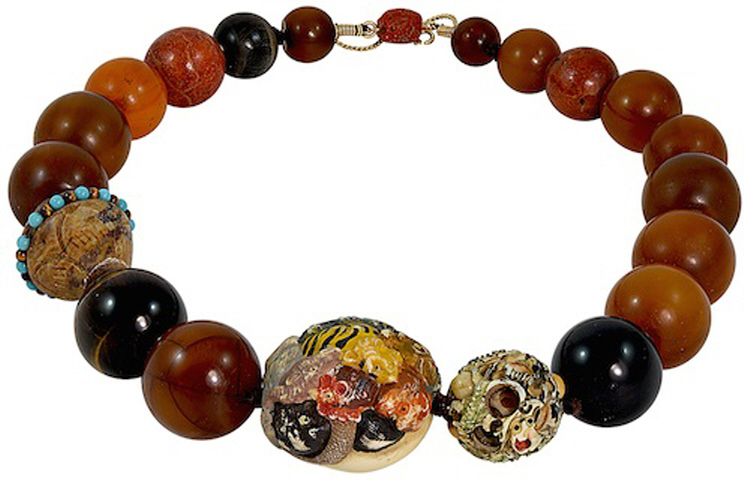 Constance Abernathy (American: 1931-1994) necklace composed of hand-carved Chinese New Year Netsuke along with a variety of hard stone beads including amber, carnelian, tiger eye, onyx, soap stone and turquoise beads. This necklace is one-of-a-kind. Necklace measures 19 3/4" long and the beads range in diameter from 13 mm to 1 5/8" in diameter. The necklace has a 14karat yellow gold clasp and safety chain. The necklace is in excellent condition.